Over the course of this blog, I’ll be regularly highlighting gear companies that are based in the Northeast region, with a particular focus on those that manufacture in the region as well. It’s a good thing to support local industries and jobs, and I’m hopeful this information will help you do so. Jetboil is first up in the series. Based in Manchester, N.H., this small company revolutionized the backpacking stove market in 2001 when it released its Personal Cooking System, or PCS ($100). This 15-ounce set-up features a 1-liter aluminum pot that securely twists on and attaches to the stove burner, forming a tight and highly wind-resistant seal. 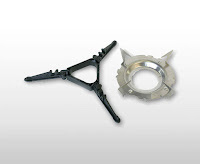 But its most remarkable engineering aspect is the FluxRing®, a raised ring that is built onto the bottom of the pot and encircles the burner head of the stove. The result is hyper-efficiency. Virtually all of the heat is transferred to the pot and its contents. When the system is set up and firing, you can hold your hand a fraction of an inch from the edge of the stove and barely detect any escaping warmth. tart bubbling and boiling over; the recommended fill line allows about 2/3 of a liter). Having used one quite a bit, I can attest to its astonishing boil times. An integrated push-button piezo ignition system means that you don’t even have to spark a lighter to get this stove going. Plus, because so little fuel is wasted, it prolongs the life span of your fuel canister, allowing you to carry less weight. According to company specs, you can boil up to 12 liters of water per 100-gram canister (those are the teeny canisters; they’re also available in 230g versions). For planning purposes, it’s probably safer to estimate somewhere between 8-10 liters per 100 grams. JetBoil makes their own fuel canisters, though any canister that features a screw valve (including Snow Peak, Primus, and MSR) will work. The PCS is slickly designed to nest together for travel. The stove burner and a 100g canister both fit perfectly inside the pot, creating a very tidy and compact little package. Other nifty features include a thin neoprene sleeve over the pot, which allows you to comfortably hold it even when the contents are magma-grade hot. The lid also doubles as a drinking cover, allowing you to comfortably sip coffee, tea, or soup. 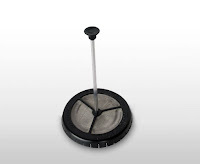 For coffee junkies like me, the optional coffee press accessory is phenomenal. Weighing only 0.8 ounces, it disassembles and neatly fits inside the pot with the stove and canister. (This took some trial and error; you need to nest the canister on top of the press and place it in the bottom of the pot.) To have my coffee equipment needs met for such little additional weight is outstanding, plus I don’t even have to bring a separate mug. Those are all the great things about the stove. If you just want to boil water—to rehydrate pre-packaged dehydrated meals, make hot drinks, melt snow—then the PCS is hard to top. If you want to cook anything, however, then you’ve got some issues. The tiny pot makes it challenging to cook anything substantial, plus its tall and narrow shape makes it difficult to work with tasty contents. It’s also really easy to burn whatever’s on the bottom because of the intense heat—I still have charred black bean residue in mine. Definitely turn the stove down low if you’re trying to cook anything that might burn. It is possible to boil enough pasta for one person, or two relatively light eaters, but more than that you can forget. $20) that clicks into place on the burner (1.2 ounces); the package also comes with a stabilizer (0.9 ounce) that attaches to the bottom of the canister to decrease the tip-factor of this tall, narrow, and somewhat top-heavy system. With the pot support in place, you can use any cookset you like, though some of the magic Jetboil efficiency is lost in the process. 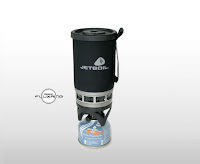 To reduce this loss, Jetboil makes larger 1.5-liter and 3-liter pots (12 and 19 ounces, respectively; $55 and $60) that incorporates the FluxRing® on the bottom and nests neatly over the pot support. Which is great, except that it makes these pots really hard to use on other stoves. Other common complaints about the Jetboil includes its push-button ignition. A thin white ceramic piece covers a wire that is placed adjacent to the burner head. When you push the button, a spark is generated between the wire and burner and ignites the fuel. I’ve heard several complaints about this failing because the ceramic covering cracks. You can buy an igniter maintenance kit to replace it ($9.95). I’ve also dealt with several cases where the wire had simply gotten bent too far away from the burner for the spark to bridge the gap. Bend it back into position and you’re all set. There was a voluntary company recall in 2008 related to a certain type of valve used during production at the time—if you purchased your stove between July and December 2008 you may want to check out the details. The popularity and success of Jetboil inspired several of its competitors to introduce similar designs. Most notable among these is the MSR Reactor, which claims even faster boil times. But no matter what the future may hold in cooking systems, Jetboil will always be remembered as a pioneer in the field.